Posted on April 16, 2019 by David M.
Last Wednesday, Susan Yurkus and I led WMB, and felt that it was not too optimistic to promise plenty of Dark-eyed Juncos. There had been a big influx of migrating juncos early in the week. The beginnings of the build-up of Wilson’s Snipes and other early shorebirds had been steady at Scotland Road’s Common Pasture. It was time for early warblers, as they have been reported across the region. What we witnessed was a lull, a pause in the waves of migrants, where it appeared that birds moved out without others moving in! At Scotland Road, there were still plenty of ducks. Watching the ducks there is like staring at a big fish tank, where you know that it may take a while to see all the species, and they are always doing something entertaining and at times even mesmerizing. Most of them are Green-winged Teal, last week, only about 60 or so. Three drake Northern Shovelers served as the “chips” in that “duck dough” that included a few Mallards and American Black Ducks. Zero shorebirds! With reasonable hope, we moved on to Artichoke reservoir on either side of Rogers St. Indeed there were lots of Ring-necked Ducks, a pair of Pied-billed Grebes, a few Great Blue Herons, Mute Swans and a couple of Wood Ducks. The later were another case of birds captured by quick-draw photographers, but not too many other observers! Watching those little grebes diving and resurfacing together was a treat. We were serenaded by a number of resident species, including a pair of Red-bellied Woodpeckers setting up a nest in a snag full of holes. 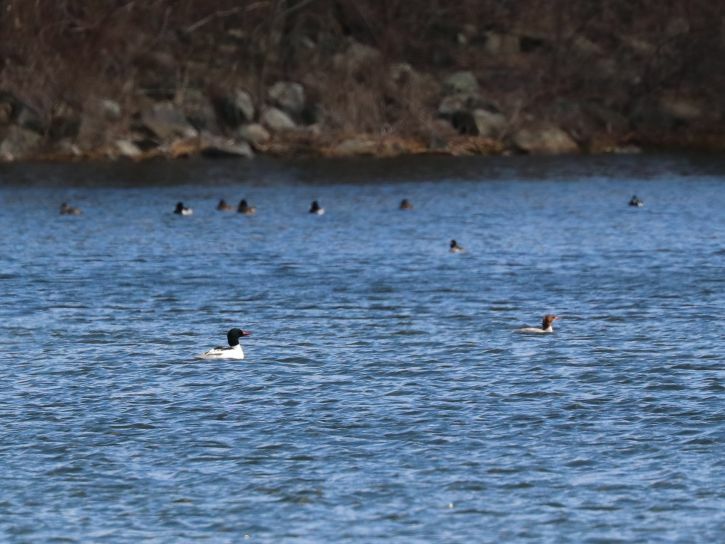 At Cherry Hill Reservoir, the number of Common Mergansers was underwhelming, but we enjoyed the ones that were there, along with more Ring-necked Ducks, another grebe, and a couple of our first Tree Swallows. The Ruddy Ducks were around the corner at the south end, which is always their preferred section of the lake. Then we were on to Plum Island, with a short pit stop at parking lot #1 on Parker River NWR, where the Eastern Mass Hawk Watch folks let us know they would appreciate it if we could send them a few more falcons. Sure, why not? An Osprey cavorted near the nest platform there, dispelling the notion bandied about earlier in the season about eagles appropriating the site. Sue McGrath’s Purple Martin houses are up, though it should be a while before the colony is fully populated. In the meantime, those volunteers will be busy warding off House Sparrows, non-violently, of course. Hoping to observe some remnant of the “sparrow fallout” Tom Wetmore extolled only a few days before, we pushed past the many ducks in the salt pannes to Hellcat. Indeed a good number of Song Sparrows fled our caravan as we moved along, but. Not. One. Junco! Nature is fun in the way our expectations are often refuted. One of the species that had recently arrived in numbers was evident, however, as we flushed several Northern Flickers along the way. When we arrived at Hellcat, the usual urge to rush up to the dike took hold, and when we got there the scene was mildly grim. A stiff northwest breeze had come up, the temperature was quite cool, and most of the ducks on Bill Forward Pool were at the other end. We could dimly make out Northern Pintails, some Buffleheads, and Mallards, but we may well have missed others. The Northern Shrike reported there earlier was no where to be seen. Hoping we might scare something up in the thickets, we began poking around the parking lot and the main road. It was very quiet, but we found two Eastern Phoebes hanging around the entrance to the parking lot, then a third further along. Only a few little sparrow call notes could be discerned, and the phoebes never uttered a syllable. I was packing up the show, when a knot of birders decided to perseverate on the phoebes in the entry circle. Eastern Phoebes are sweet little things, and not everyone had heard of the foraging technique flycatchers use called a “sally.” So we watched them a bit more, and by hanging around, a few of us got a glimpse at a Ruby-crowned Kinglet that shot through. One “FOY” Eastern Towhee crossed the road in front of us as we departed, and that was it for this week, other than cataloging the usual dabbling ducks in the Main Panne and slowing down for this magnificent Wild Turkey on our way out. The “quiz birds” we looked at this week were Wilson’s Snipe and Palm Warbler, as we expect them, but I had to wait until a quick visit to Belle Isle Marsh later in the week to find them. 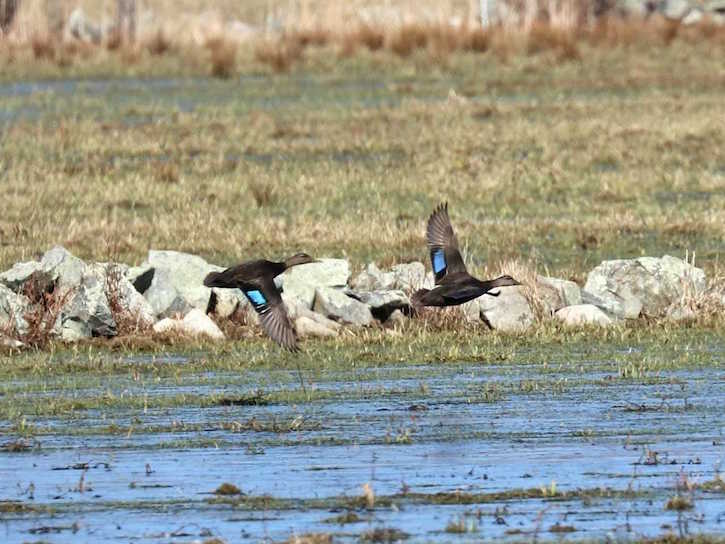 Every week will be another exciting spin of the wheel of spring migration as we move forward, until summer haze, Greenhead Flies, and beach-goers put us into our own lull in the heart of the breeding season. We hope you can join us for one of the many outings we have in store in the coming season! Mute Swan (4) – Artichoke Reservoir. Wood Duck (2) – Artichoke Reservoir. American Black Duck (4) – Scotland Road, Common Pasture. Green-winged Teal (~60) – Scotland Road, Common Pasture. Ring-necked Duck (~20) – Artichoke Reservoir and Cherry Hill Reservoir. Bufflehead (~10) – Artichoke Reservoir and Cherry Hill Reservoir. 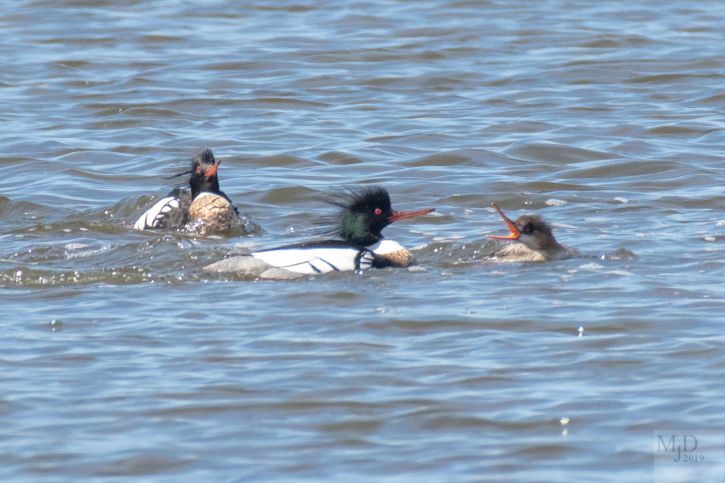 Common Merganser (~25) – Cherry Hill Reservoir. 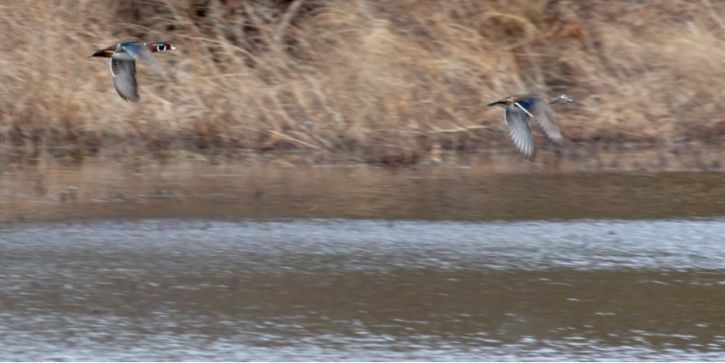 Ruddy Duck (12) – Cherry Hill Reservoir. Pied-billed Grebe (3) – 2, Artichoke Reservoir 1, Cherry Hill Reservoir. Great Blue Heron (3) – Artichoke Reservoir. Turkey Vulture (3) – along route. 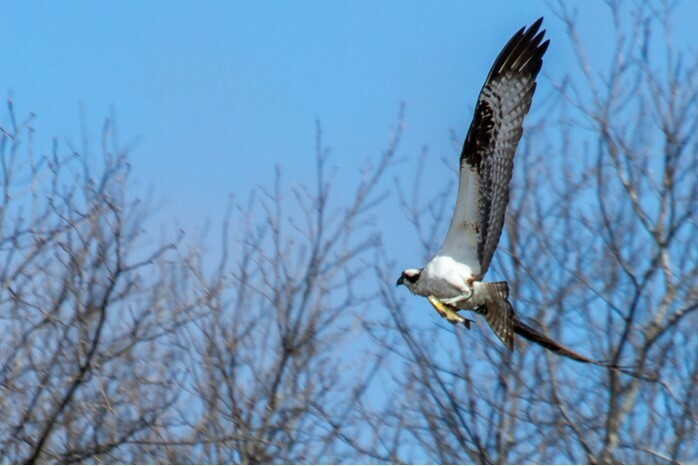 Osprey (1) – Artichoke Reservoir. Red-Tailed Hawk (1) – along route. Mourning Dove (1) – along route. Red-bellied Woodpecker (2) – using nest cavity at Artichoke Reservoir. Blue Jay (1) – Artichoke Reservoir. Tree Swallow (2) – Cherry Hill Reservoir. Black-capped Chickadee (2) Artichoke Reservoir. Tufted Titmouse (3) – along route. Northern Mockingbird (1) – Scotland Road. Northern Cardinal (1) – Artichoke Reservoir. Common Grackle (3) – Cherry Hill Reservoir. Mute Swan (1) – Bill Forward Pool. Gadwall – (~40) – Pannes. 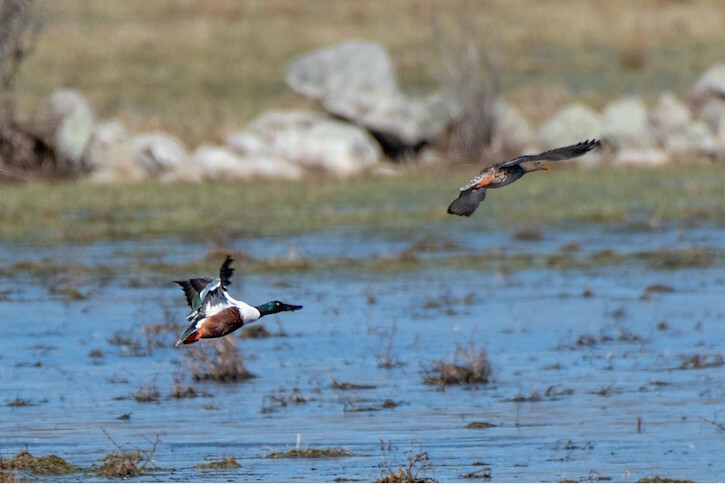 American Wigeon (4) – Main Panne. American Black Duck – common. Scaup sp. – Bill Forward Pool. Bufflehead – (2) Bill Forward Pool. 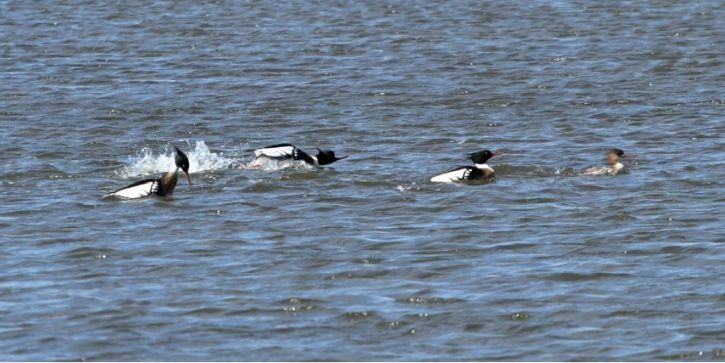 Red-breasted Merganser (1) – Salt Pannes. 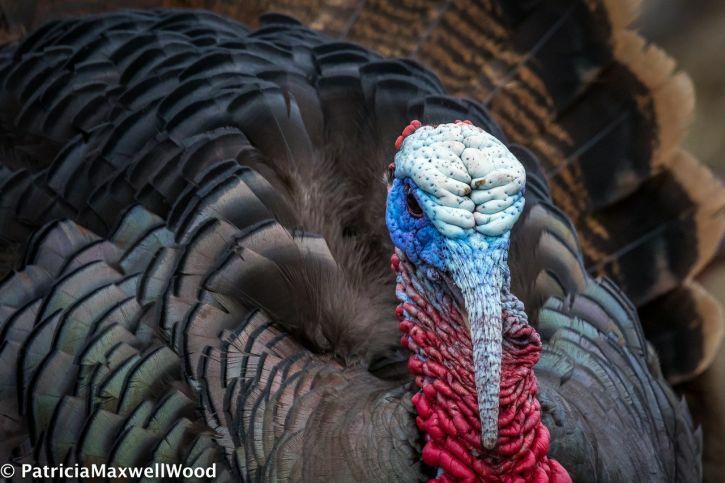 Wild Turkey (9) – S-curves. Double-crested Cormorant (1) – Bill Forward Pool. Great Blue Heron (1) – North Marsh. Great Egret (2-3) – North Marsh. Osprey (1) – North Marsh. Killdeer (2) – Maine Panne. Great Black-backed Gull (1) – North Marsh. Northern Flicker (~10) – roadside. Eastern Phoebe (3) – Hellcat. Black-capped Chickadee (2) – Hellcat. Ruby-crowned Kinglet (1) – Hellcat. Eastern Towhee (1) – Hellcat. Song Sparrow – abundant along roadside. White-throated Sparrow (2) – Hellcat. 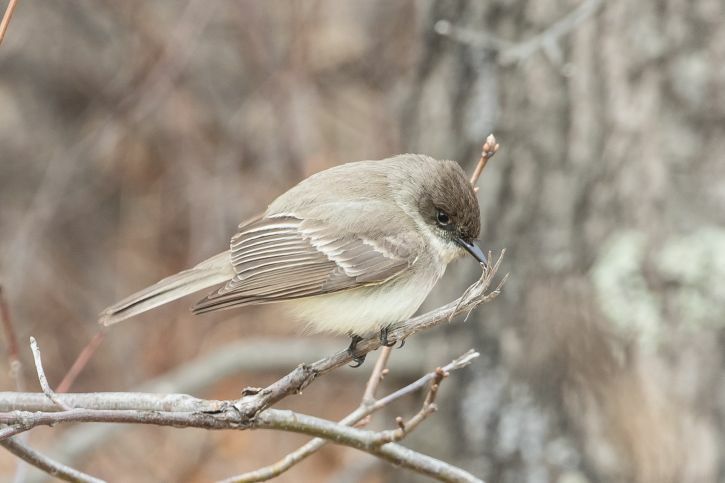 This entry was posted in Birding on April 16, 2019 by David M..
Posted on April 5, 2019 by David M.
Susan Yurkus and I led a small band of hearty folks out into the wilds today, with some interesting results. We started at Scotland Road, with a variety of ducks including a pair of Northern Shovelers, a few Wilson’s Snipe, and, after much searching, a Reeve (presumably the continuing bird from the weekend.) We checked the wet field on Turkey Hill Road without finding any more snipes. Then we headed out to the Parker River NWR on Plum Island. On the refuge we motored determinedly down to Sandy Point to check for Piping Plovers and found one just over the line in the refuge. In the large crashing surf at high tide there were scoters, eiders, long-tailed ducks, and one Horned Grebe. We headed back north on the refuge looking for ducks or anything moving. At the blind on the Bill Forward Pool we had Northern Pintails, Hooded Mergansers, Common Goldeneyes, Buffleheads, and American Black Ducks and Mallards. We added Gadwall and a marvelous display of three male Red-breasted Mergansers competing for one female’s attention at the main pannes. With the sun coming out, it turned out to be a glorious day. Turkey Vulture (3) – at Joppa Flats. Cedar Waxwing (12) – at Joppa Flats. Osprey (3) – t Pines Trail platform, 2 copulating. 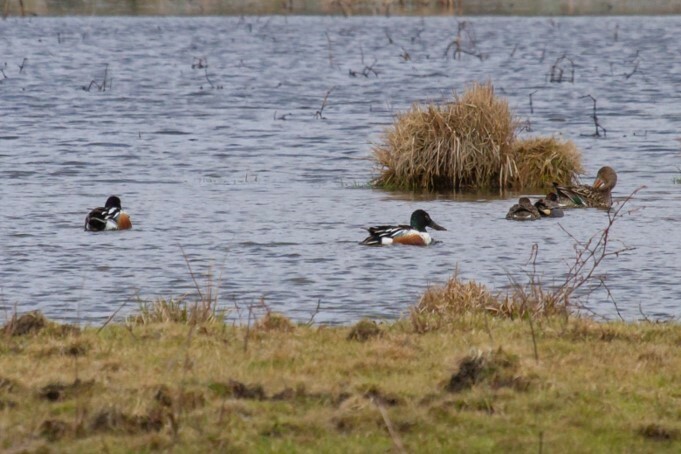 This entry was posted in Birding on April 5, 2019 by David M..
Posted on March 30, 2019 by David M.
This Wednesday, March 27, Donna Cooper and I led Wednesday Morning Birding inland to see the spectacle of ducks along Scotland Road in Newbury. 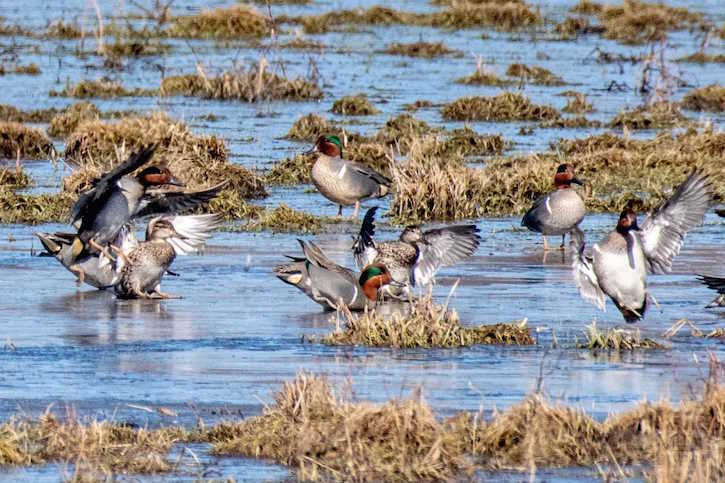 We found the pools at the Common Pasture full of excited Green-winged Teals, with resplendent males busily vying for attention. 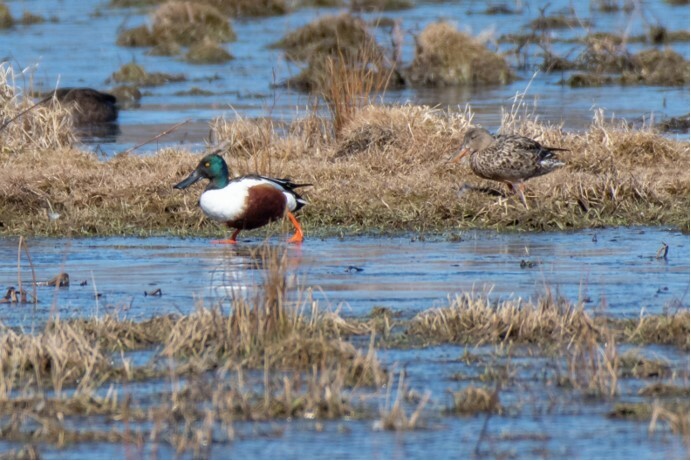 A drake Northern Shoveler was snoozing when we arrived, but he woke to join his female in the parade. Even a pair of American Black Ducks got in the spirit, all of them looking fabulous in the bright sun, which doubly highlighted the many hues of the ducks as it reflected off the smooth pools. A flock of eight Killdeers made a brief appearance on the meadow, and the air was filled with early spring birdsong. The show there will continue through this month. We await appearances by uncommon species such as Blue-winged Teal, Eurasian Wigeon, or perhaps a Sandhill Crane if we are lucky. In the fields on our way to Plum Island, we passed flocks of American Robins, who have announced spring to most people, regardless of their ornithological acumen. Three Turkey Vultures soared over Route 1, near where a kettle formed most afternoons throughout the winter. The non-migration of the TVs says “climate change” to us. 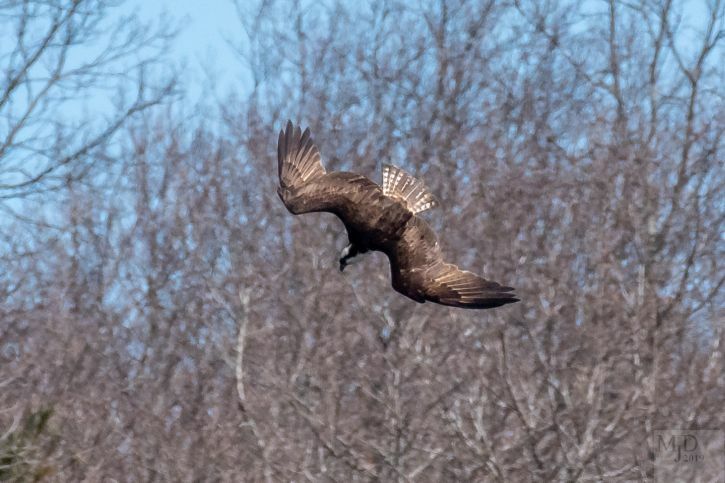 They always moved in and out of Pennsylvania when I was growing up, but now they stay there along with Black Vultures, a few of which wintered even in Massachusetts this year. At parking lot #1, where we made only a brief stop for the facilities, we searched for adult Bald Eagles that have been seen sitting in a pair on one of the Osprey platforms in the marsh. We didn’t see them, but a House Finch sang forcefully from the gatehouse. American Black Ducks and Canada Geese were all over the marsh for now, as the duckiest month approaches. At the Main Panne, American Black Ducks predominated, but there was a good gathering of eight Gadwalls and a pair of American Wigeons. An American Goldfinch “potato-chipped” behind us, reminding me of how few of them have been around this winter. Red-winged Blackbirds are arrayed up and down the island now; we were still enjoying how their intense calling fill us with the sense of spring. At Emerson Rocks, off of the parking lot #7 dune platform, we hoped to see a lot of things, including Piping Plovers that were spotted by Stan Deutsch in a pre-WMB scouting run. Alas, they must have moved on, though we know they are hanging out at Sandy Point. We did have a good selection of wintering, or now migrating, sea ducks. 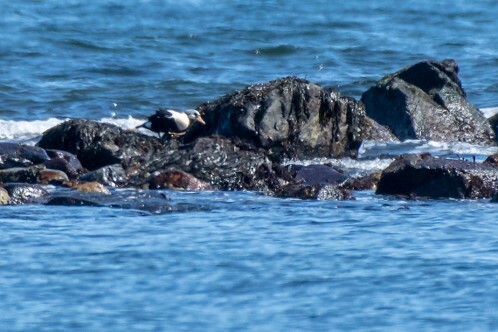 American Goldeneyes, Long-tailed Ducks, Common Eiders, and Black and White-winged Scoters crowded around the rocks. The latter scoters were much less abundant, but a Horned Grebe beginning to transition into alternate plumage had us studying that look in the field guide. The sub-adult male King Eider that has stolen the show all winter was still there; we hope he comes back next year sporting a fully mature, bright bill! We had passed some Ring-necked Ducks on Stage Island Pool on our way south, so we stopped in to enjoy them on our return trip. They were very close to the road, and as we watched, some of us saw an American Coot come out and disappear around the corner of a spit of reeds. Off in the distance, a raptor (which eventually resolved, in the light-distorting air, to be a Rough-legged Hawk) perched in a thin line of trees. It was a great day in the Great Marsh and inland, presaging a month when the excitement of the neotropical migration builds. We hope you will join us to witness it! American Black Duck (2) – Common Pasture. 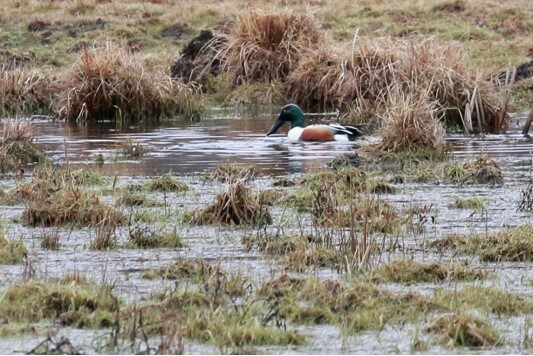 Northern Shoveler (2) – Common Pasture. Green-winged Teal (~30) – Common Pasture. Rock Pigeon (~15) – various. Killdeer (8) – Common Pasture. Turkey Vulture (3) Near Rt. 1. American Crow (2) – Common Pasture. Common Raven (2) – Common Pasture. House Sparrow (4) – Common Pasture. Brant (~20) – Bar Head. Mute Swan (2) – South Pannes.Gadwall (8) – Main Panne. American Wigeon (2) – Main Panne. Ring-necked Duck (9) – Stage Island Pool. King Eider (1) – Emerson Rocks. White-winged Scoter (3) – Emerson Rocks. Black Scoter (~50) – Emerson Rocks. Long-tailed Duck (~10) – Emerson Rocks. Bufflehead (2) – Bar Head. 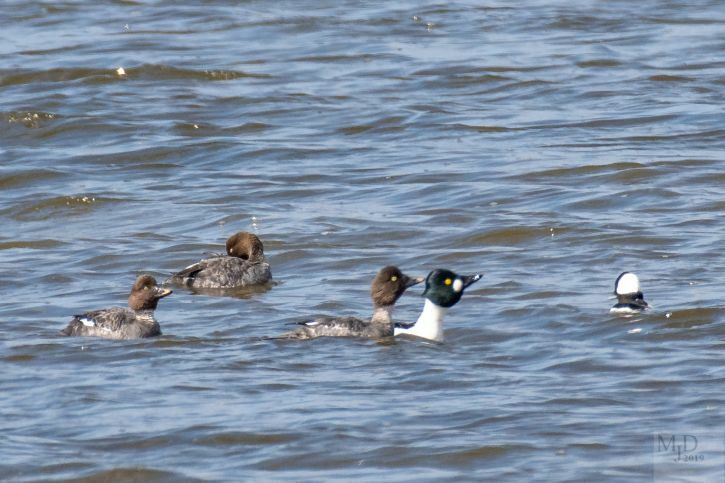 Common Goldeneye (~10) – Emerson Rocks. Red-breasted Merganser (2) – Plumbush River. Horned Grebe (1) – Emerson Rocks. American Coot (1) – Stage Island Pool. Osprey (1) – Pools near Wardens. Northern Harrier (3) – North Field. Rough-legged Hawk (1) – Trees beyond Stage Island Pool. Black-capped Chickadee (1) – parking lot #1. American Robin (4) – various. Northern Mockingbird (1) – parking lot #7 thicket. Common Grackle (~15) – parking lot #1. American Goldfinch (1) behind Main Panne. 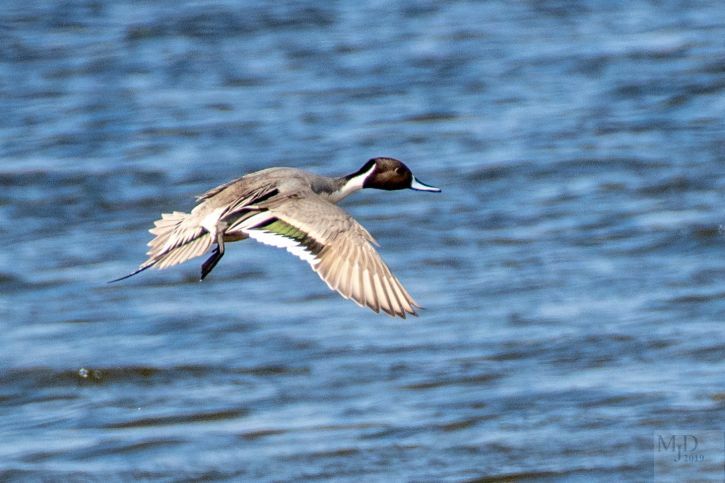 This entry was posted in Birding on March 30, 2019 by David M..